PowerShell is an advanced form of command prompt. It is extended with a huge set of ready-to-use cmdlets and comes with the ability to use .NET framework/C# in various scenarios. Windows includes a GUI tool, PowerShell ISE, which allows editing and debugging scripts in a useful way. If you are using it frequently, you might find it useful to add “Edit with PowerShell ISE as administrator” to the context menu. Windows Registry Editor Version 5.00 [HKEY_CLASSES_ROOT\Microsoft.PowerShellScript.1\Shell\PowerShellISE_Elevated] @="Edit with PowerShell ISE as administrator" "HasLUAShield"="" "Icon"="PowerShell_ISE.exe" [HKEY_CLASSES_ROOT\Microsoft.PowerShellScript.1\Shell\PowerShellISE_Elevated\command] @="PowerShell -windowstyle hidden -Command \"Start-Process cmd -ArgumentList '/s,/c,start PowerShell_ISE.exe \"\"%1\"\"' -Verb RunAs\""
@="Edit with PowerShell ISE as administrator"
@="PowerShell -windowstyle hidden -Command \"Start-Process cmd -ArgumentList '/s,/c,start PowerShell_ISE.exe \"\"%1\"\"' -Verb RunAs\""
Double click on the file Add Edit With Powershell ISE As Administrator.reg and click Yes to add it to the registry. 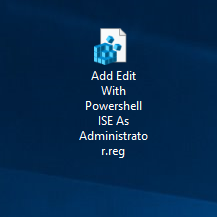 To remove the option “Edit with PowerShell ISE as administrator“, save the registry settings below to “Remove Edit With Windows Powershell ISE As Administrator.reg“. Double click on the file “Remove Edit With Windows Powershell ISE As Administrator.reg” to remove the option from the context menu.